Lt. James Lovelady Is Killed in Crash First Lieutenant James Lovelady, son of Dr. and Mrs. Ralph Lovelady of Sidney, serving in the army in the Aleutians, is reported killed in a plane crash according to word received by his parents, shortly before noon today. 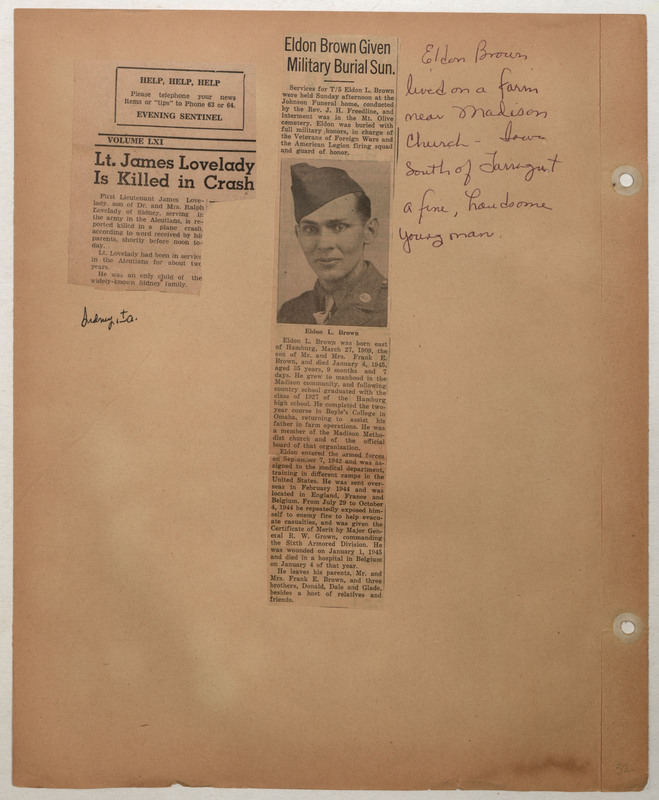 Lt. Lovelady had been in service in the Aleutians for about two years. He was an only child of the widely-known Sidney family. Eldon Brown Given Military Burial Sun. Service for T/5 Eldon L. Brown were held Sunday afternoon at the Johnson Funeral home, conducted by the Rev. J. H. Freedline, and interment was in the Mt. Olive cemetery. Eldon was buried with full military honors, in charge of the Veterans of Foreign Wars and the American Legion firing squad and guard of honor. Eldon L. Brown was born east of Hamburg, March 27, 1909, the son of Mr. and Mrs. Frank E. Brown and died January 4, 1945, aged 35 years, 9 months and 7 days. He grew to manhood in the Madison community , and following country school graduated with the class of 1927 of the Hamburg high school. He completed the two year course in Boyle's college in Omaha, returning to assist his father in farm operations. He was a member of the Madison Methodist church and of the official board of that organization. Eldon entered the armed forces on September 7, 1942 and was assigned to the medical department, training in different camps in the United States. He was sent over seas in February 1944 and was located in England, France and Belgium. From July 29 to October 4, 1944 he repeatedly exposed himself to enemy fire to help evacuate casualties, and was given the Certificate of Merit by Major General R. W. Grown, commanding the Sixth Armored Division. He was wounded on Jaunary 1, 1945 and died in a hospital in Belgium on January 4 of that year. He leaves his parents, Mr and Mrs. Frank E. Brown, and three brothers, Donald, Dale and Glade, besides a host of relatives and friends. (Handwriting on the side) Eldon Brown lived on a farm near Madison Church, Iowa south of Farragut A fine, handsome young man.